An employee disciplinary memo is a statement made on behalf of a host company on an employee who has stepped out of line or broken company rules while at work. A memo for disciplinary action is only handed to an employee when things have gone too out of hand to be controlled verbally. Since an employee disciplinary memo is about taking strict actions against an employee whose behaviour or performance have done more harm than good to the company, it has to be drafted with great care. The use of correct technical language is absolutely essential for writing the memo. You cannot simply overlook the need for the right kind of language meant to be used on legal paperwork. However, a disciplinary memo has to be written very differently from any other legal forms and notices. You cannot make it fall in line with anything else you have written on behalf of your company before, except if it was also a disciplinary memo. But the contents every time will be different depending on what causes the need for drafting the memo. Due to the change of subject owing to different kinds of mistakes made by employees, the language keeps changing to suit the style of statement. Writing a disciplinary memo can be quite a difficult task. It may seem all the more difficult since you are going to type off against someone who works with you. Every so often the person on the radar turns out a close friend which makes it very difficult to figure out what to write without appearing cold hearted. Besides this you may even be clueless about how to decide on the protocol that needs to be followed as to what the employee has done. But if you take all of this on yourself thinking that you are better off not taking help from a senior or a mentor because it is your job to know, then that can make things worse. None of us would want to accept help unless we have no choice but being over-confident and too stubborn to accept help from others when there is no other option will drop you down. You can choose to check with a disciplinary action memo sample if you are confused about what to write. Looking at some sample disciplinary action memo is nothing to be ashamed of if you are at a loss for words. It is always better to be sure than making a mistake in over confidence. There are plenty of formats available on the internet to take help from. Moreover, company booklets have all information in details on how to draft a statement on every possible occasion. All the same, comparing your memo with samples lowers the risk of making mistakes. So it is better to refer to the ways mentioned in formatted samples than to get your mistakes pointed out by higher officials. 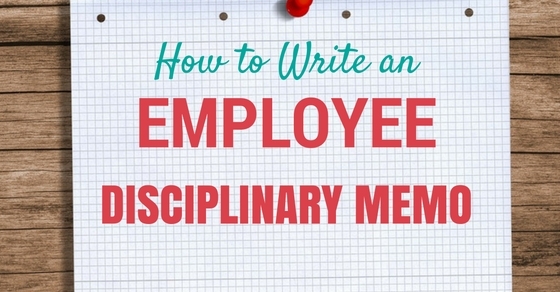 Employees are usually punished on disciplinary memos due to their lack of performance. So try to include why the employers think that the concerned employees should have to face this. Make a note of the mistakes he/she has made over time to attract the negative attention of the higher up. Getting a memo is not sudden, it takes a long time sometimes even after being excused for years. So it should not be too hard to find why the employee deserves to abide by the norms of the memo. If it is because of performance related issues then point out where he/she has gone wrong too many times to be excused any longer. Normally a memo is not issued until the warnings are ignored by the employee for too long. Not having a good behavior at work is bound to get employees in the bad books. No company wants to spoil its reputation by hiring employees who cannot behave themselves. So another reason why employee disciplinary memo is necessary is because of behavioral reasons. Employees who are out of line or misbehave with their colleagues are often told upon and they have to face the music. Drafting a memo on the behavioral issues of an employee is quite a task. You need to gather all the complaints from all the victimized colleagues who decided to tell on the person at fault. A disciplinary memo does not drop out of the blue. The employee must have been a continuous disappointment for the employers and the company as whole. Employers would only turn to such a harsh option only when things are about to get out of hand. Otherwise as in every normal situation they try to solve the matter by talking it out with the concerned employee. But when things start going for the worse the accused cannot be let off so easily. So your task would be to state every word on why action is being taken against the employee very carefully. More often than not things get lost in translation so make sure you have made a note of exactly what your employers have said. Mention each and every reason as to why the employee is being handed a disciplinary memo. Take every word of advice the head of the department has to offer on what to do in case you have to charter a disciplinary memo. Most often the employee under surveillance has to follow a hard and fast improvement plan. And it will come down to you to make every inch of the plan from what your employer tells you. Things would be best if you take help from the company book of rules since it will most probably be the best possible way to figure out how to make an effective PIP. Improvement plans basically have to do with sending the employee back to work as soon as possible on the word that he/she won’t make the same mistake again. In this PIP program employees are told to improve performance. And it as a rule has stages for the employee to gauge improvement in their behavior and performance. Do not ever try to take the whole matter into your own hands. Always speak to your senior before deciding what to finally put in the memo. Your seniors would probably have a better idea about how the situation is to be dealt with. Moreover, a memo is asked to be made only when there are too many problems with the employee concerned. So unless a lot of people are having troubles with the person there would be no need to draft a memo. Therefore decisions are usually made on the severity of the circumstances and your seniors may also think it necessary to have your opinion in the matter. When a man’s career depends on what you have to say in the matter you cannot hope to pass a quick judgment. Normally the employee to whom the memo is addressed is not informed about it beforehand. It is against company rules to tell employees that they are about to get a disciplinary memo for their mistakes. So depending on the severity of offense, the actions are taken. A memo like that is most likely to change anybody’s career path upside down. So it is better that you deliver the news personally when the memo is passed. The employee despite what he/she has done will take less offense on receiving the news in person rather than electronically. This way of delivering the memo has more impact than any other way since it makes the employees feel more ashamed of one’s misdeed. Always keep a second copy of every important document for future use. You never know what might come up or how badly an employee would take being handed a disciplinary memo. A disciplinary memo often comes with problems if the employee is unwilling to consort to the allegations made in the memo. This can be a very drawn out process if the employee is not willing to admit his fault and wants to take legal actions against the company. At times like that you will be needed to present every possible document in the court of law to prove that the allegations made were completely true. Even in case of a retraction, you will need to refer to the memo code and to do that you will have to keep every piece of document in place. Things may start to get personal if the person being reprimanded is someone you are close to. But do not let personal relations rule your head. If you let personal reasons get into your head and take the decisions for you then you would never be able to see yourself as loyal anymore to the company. That being said, do not let personal rivalry get the best of you if someone you don’t like at the company is receiving a memo. Do not take out your personal issues out on somebody just because you have got a chance to use unfair means to take revenge for whatever the person has done to you. This is a simple company decorum. You have to write in the medium the company has confirmed in the rulebook. It goes without saying that the medium of language chose by the company is not going to go against the constitution of America. Also, keep in mind that you are supposed to keep your emotions at bay while considering the consequences for the employee concerned if you happen to know the person. If the company heads any kind of foul play on your part, then it will be your head next on the chopping block. However, if you are still none the wiser then ask somebody who is experienced in the matter and can help you make the right decisions for the employee and the company. Make sure you have got the memo checked at least twice by the head of the company before getting it printed. Even if you think that you are the best at the job and that you have left no stone unturned to point out all the right things that needed to be said, you should still run it by your mentor or the head. Do not be so confident that you don’t feel that it is necessary to ask more experienced people if there is anything else to be added. There is always the possibility that you might make a mistake which could have been avoided only if you had the sense to ask for help from your senior. Substantiate the memo by quoting as much as you can from the company rule book. You can hold a clearer picture to the employee if you can compare all his/her mistakes to the norms of violation and misconduct stated in the company rule book. Moreover, the memo becomes much easier to write when you can gather up solid reasons for why the employee has to face the music. And if you quote heavily from the rule book there is very little chance that the employee would be able to deny having made the mistakes mentioned in the memo. There is a given format that needs to be followed while drafting an employee disciplinary memo depending on the sort of allegations brought down on the employee. In addition to the above given points you may even look for different templates or sample of disciplinary memo that are available in pdfs on the internet for visual aid. Previous articleShould You Resend Your Application If You Notice a Mistake?